Killed May 3rd, 1915, near Clarke, Alabama. 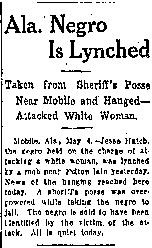 Hatch had been arrested and was in the custody of a sheriff’s posse when he was lynched. No investigation or arrests resulted. The sheriff was not disciplined for losing his prisoner.